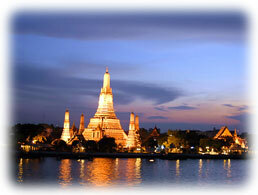 Bangkok is an interesting juxtaposition of ancient heritage with the sophistication of a modern metropolis. See magnificent palaces like Grand Palace and Vimanmek Mansion and glittering Buddhist temples co-exist alongside contemporary hotels and towering skyscrapers. Bangkok takes great pride in its splendid temples, especially Wat Phra Kaeo (Temple of the Emerald Buddha), Wat Arun (Temple of the Dawn) and Wat Pho (Temple of the Reclining Buddha) located around the capital. Visiting Damnernsaduak Floating Market and cruising on Chao Phraya River are great ways to observe the local lifestyle close-up. Hone your bargaining skills at Patpong Night Market, Suan Lum Night Bazaar or the famous Chatuchak Weekend Market where you can pick up traditional Thai handicrafts and trendy clothes among many others. It will be a good idea to bring an extra empty suitcase for all your purchases. Book a room at one of our Bangkok hotels and start shopping! Amanta - Ratchada Serviced Apartment locate in Ratchada Road. Easy access to the heart of Bangkok business, shopping and entertainment district by just five minutes walk to subway Station Thai Cultural Center. The Ambassador Hotel Bangkok has long been a favourite choice of business and leisure travellers to Bangkok. The hotel is located right in the center of Bangkok's main business and entertainment district at Sukhumvit Road. The popular and well appointed Asia Hotel, Bangkok is located in Phayathai Road, within easy access to the colourful shopping, business and entertainment areas. Bangkok City Inn, located on Rajdamri Road which is one of the best location to reach all the parts of the city, including the expressway leading to the airport. The Davis Bangkok "An idyllic oasis in the heart of Bangkok" can be a fitting description for this prestigious collection of 10 Thai style pavilions, located in the commercial area of Bangkok. Asia's new fashion hotel shot in the arm...a true "Hautel Couture" 5-star experience situated in the heart of Sukhumvit road; Bangkok's pulse for fashion, entertainments, city's top restaurants, shopping centers and businesses. The Ecotel Hotel Bangkok is located in the heart of the city and is near to the business and the entertainment areas. The hotel is near to the shopping areas and near to important landmarks of the city. The hotel is near to the International Airport through the Sky Train and near to the Sky train. Opened in November 1992, and managed since 2006 by HotelCorp, The Emerald Hotel is located in the midst of one of Bangkok’s busiest commercial and entertainment hubs and remains a favourite with both business and holiday travellers. Whether on business or holiday, each of the 600 rooms at this 4-star property are designed help guests relax in comfort and style. Included in all rooms are hair dryer, non-smoking rooms, electronic/magnetic key, air conditioning, private safe, in-room movies, tea/coffeemaker, minibar. There are air conditioning in each of the hotel's well-equipped rooms. This excellent hotel in Bangkok also has restaurants. Everything the hotel does is centered around the guest' experience, ensuring comfort and relaxation. Le Bua at State Tower (formerly Meritus Suites) is the latest deluxe serviced residence in Bangkok's most established gem wholesale and retail district. Located on the corner of Silom Road and Charoen Krung Road. Situated in the heart of this vibrant city, Radisson Hotel Bangkok is just minutes by car from Bangkok's commercial and entertainment district. Blending contemporary design with traditional Thai elegance, the hotel is the perfect destination for discerning business. The management and staff of The Unico Grande Silom offer you a warm welcome and invite you to enjoy our hospitality and excellent facilities. The newly renovated guest rooms are comfortable and spacious, and at our restaurants and bars you will enjoy quality cuisine provided by our friendly staffs. The Unico Grande Sukhumvit (La Boutique Hotel) - a sister property to Unico Grande Sathorn under the umbrella of newly establishment property management - The Unico Property Management Company Limited (UPM). The Zenith Sukhumvit Hotel, Bangkok is located in the heart of Bangkok’s commercial and residential district with easy access in the airport expressway. Within walking distance to shopping areas and major embassies.